Grab a bowl and cozy up with fresh, homemade popcorn with the AtomPop! What is the Atom Pop? The Atom Pop is a stove top popcorn popper. It makes 2 1/2 quarts of popped corn. It is as convenient as microwave popcorn and is healthier without the additives. 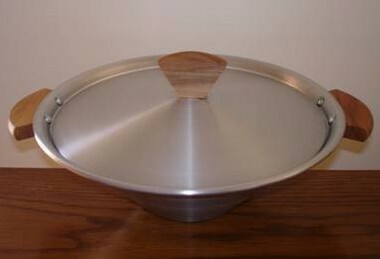 The bowl measures 10 1/2 inches in diameter at the top and the base is 3 3/4 inches in diameter. The handles are made from American Sycamore for attractiveness and durability. Atom Pop can be cleaned in a dishwasher. If you burn your corn, you can scour the bowl with any cleanser.